Sometimes travel is about taking in all the sights and sounds of a country and other times it’s about collecting passport stamps and seeing as many places as you can at one time. 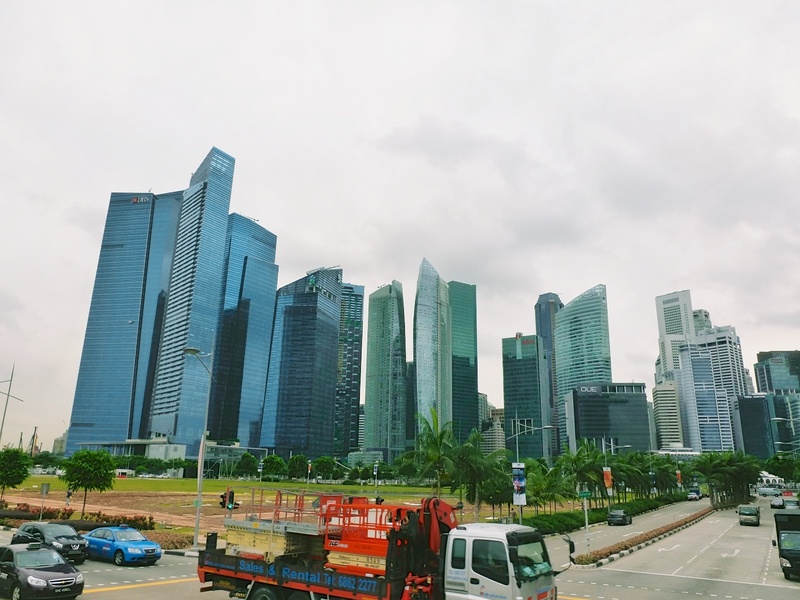 For us, visiting Singapore was a planned weekend escape and a taste of the city life we were missing. Our weekend in Singapore provided culture shock in a totally different way than India. It’s as if someone plucked out the city/state from an episode of the movie, the Stepford Wives and said ok we built it let the people come. The Republic of Singapore is a Southeast Asian city-state consisting of 63 islands sandwiched between the Malay Peninsula and Indonesia. There are 5.18 million people living in Singapore of whom 3.25 million are citizens. The country is incredibly diverse and you can see it in the faces of the population, the neighborhoods, food and art. The majority of the population is Chinese but Malays and Indians comprise significant groups and a small percentage of Europeans/Australians live here as well. While English is the official language, Mandarin, Malaya and Tamil (Indian) are widely spoken. Singapore claimed it’s independence from the British in 1963 uniting with the Malayan Peninsula to form Malaysia but there were cultural and economic difference amongst the neighbors and in 1965 Singapore separated from Malaysia to form it’s own independent city-state. The country enjoys enormous wealth and relies heavily on imported goods and manufacturing. It’s the fourth largest financial center in the world and is known as one of the freest and most innovative economies today. Singapore answered all my pleas. To say it is clean is one thing; to say the sidewalks, streets, bathrooms are delectable is quite another. About 10 million people visit Singapore each year and I am sure most of them come for the shopping but for me it was a country to scratch off the bucket list. I loved it. Jill’s adverse reaction to the weather coupled with the crowds of shoppers did not go unnoticed but I only found displeasure in the number of zeros in my checking account since Gucci, Prada, Bottega, Valentino and Miu Miu are not on my speed dial. Singapore is a woman’s paradise and a man’s hell. There were Starbucks on every corner, Hawker (ethnic food stalls) in building after building, pockets of historical neighborhoods like Chinatown and Little India, tree lined streets and planned green spaces scattered amongst the high rises of residential housing and mall after mall after mall. We browsed the stores cautiously as our purchasing power vanished. The Chinese occupied every counter and cash register in the country – A sign of the times for certain. On our visit to Chinatown, the cleanest Chinatown I have ever seen, we ventured into a spa place and after a few pictures and a brief conversation we partook in an ion cleanse. Feeling like a bit of a guinea pig, we learned that an ion cleanse is an external detoxification method, which removes toxins from your feet similar to electrolysis. The process is similar to a pedicure minus the grooming and painting. After soaking my feet in warm water for 30 minutes, the water turned a freakish orange/brown color and a foam resembling vomit appeared on the surface of the water. The lovely technician reported her findings: “Your gallbladder and liver bad (The palm reader predicted similar gallbladder malfunction), you have stiff back and bad shoulders, your body tired, you need exercise more and you eat too many sweets (shocking this one truly alarming).” When we moved on the reflexology, I learned my eyes are troubled and my hips are weak. Clearly, my body is falling apart. Singapore is a mix of Vegas (lights and abundant shopping), a hint of Hong Kong (international finance), a taste of New York (food, entertainment, diversity) and a great place to spend the weekend “sweating” in the sights. It’s hot and humid and you may – just may – appreciate the sprawling mall developments as they are fully supplied with AC. Rules – there are plenty. No smoking, no chewing gum, no public urinating (personal favorite), no drugs, fines for NOT flushing the toilet – a little totalitarian but since it enhances my experience I am fine with it. Singapore is one of the safest country’s in the world. I finished off my weekend with a movie screening of the final Twillight episode and a glass of red wine. Singapore, a prescription worth filling, rejuvenated my body for the next leg of the trip. Bali Hai, Indonesia up next.